The night didn't start out exactly as planned. Falling onstage, audio drops and static bleeding through the mic. For any artist, this would've been disastrous, but for Kristeen Young? Merely a fallen mirror-tile from the disco ball that IS Kristeen Young. One glass chip may have fallen but the ball continues to shine just as Kristeen did Monday night during her May residency at The Hotel Cafe. More of a blessing in disguise, what started out feeling empty ended up being a memorable performance that only reaffirmed that, for this one woman show, this stage cannot keep this sonic butterfly confined. 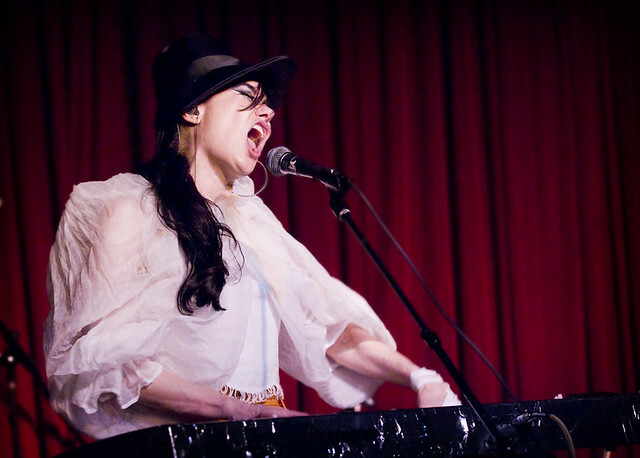 Hotel Cafe is known for its toned-down to near-silent performances but Young was having none of that. More Slash than Tori Amos, Young uses her keyboard as the guitar equivalent for her songs, pounding and shredding away in songs like "Depression Contest" and "V The Volcanic" while landscaping dramatic abstract melodies to showcase her four-octave vocal range in songs "I'll Get You Back" and "Why Can't It Be Me." Like a sharp, smooth boulder, cut fine over time by water, Kristeen's grace through ordered chaos is one to be witnessed. Even for this tiny stage, like a balancing act on a highwire, what it takes four band members to accomplish, Kristeen does it with just one - herself. Aggressive at times, but controlled, V The Volcanic, released earlier this month, is a collage of beautiful imaginative songs recorded with legendary producer Toy Visconti (David Bowie, Morrissey). The last day to catch Kristeen Young in Los Angeles is next Tuesday (5/24) when she completes her month-long residency at The Hotel Cafe. 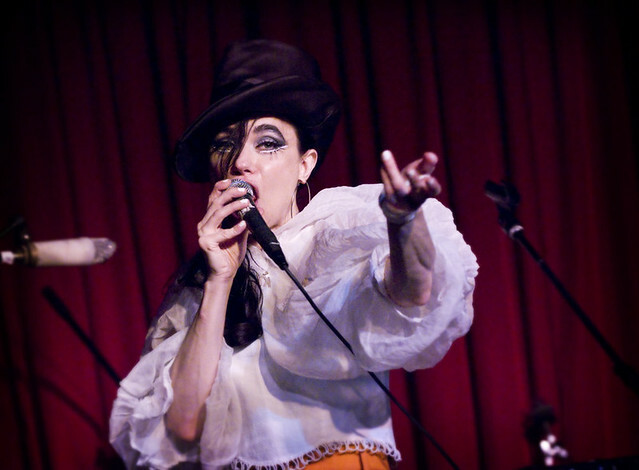 Kristeen Young at The Hotel Cafe. "Fantastic Failure" off her new album V The Volcanic by Kristeen Young.